Yet another of my jewelry prototypes. I’m really fond of this design. Its just….elegant. The process of carving, sanding and finishing this design is extremely time consuming. With 2 different iterations breaking in the carving process, I’m going to have to rework it to strengthen the sides and thicken certain portions of the wood. But this design has legs. I’ll need to pick a different colored glass. As much as I love the rippled green stained glass, it doesn’t read. When held up to light, the green glass just glows with rich viridian hues. But they aren’t going to be worn in front of a window, but snug against the skin. Without a bright lighting source behind them they read as black or dark, dark green. I’m probably going to need to switch to an opaque color. ……maybe a rich red or orange? The tools necessary for the intricate work of carving jewelry is very different from those I use on larger scale pieces. I have to put together custom vises, micro chisels and use the most delicate drills on my Dremel to put these pieces together. It all has a very ‘Geppetto’ like feel! 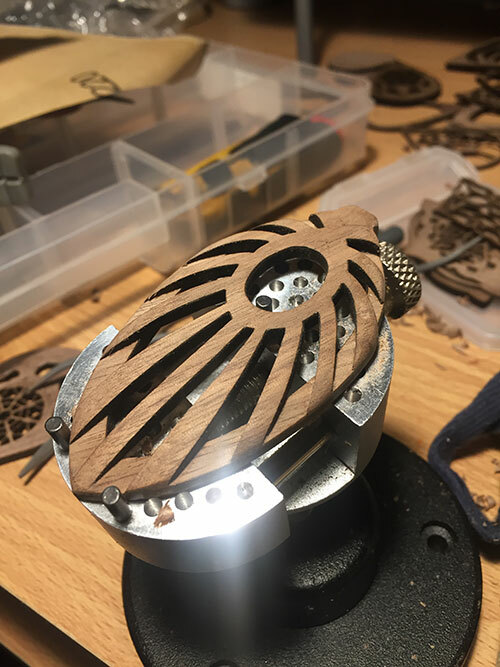 Months and months of concept design work, carving, cutting, sanding and grinding have finally produced my first (albeit imperfect) prototype pendant necklace! 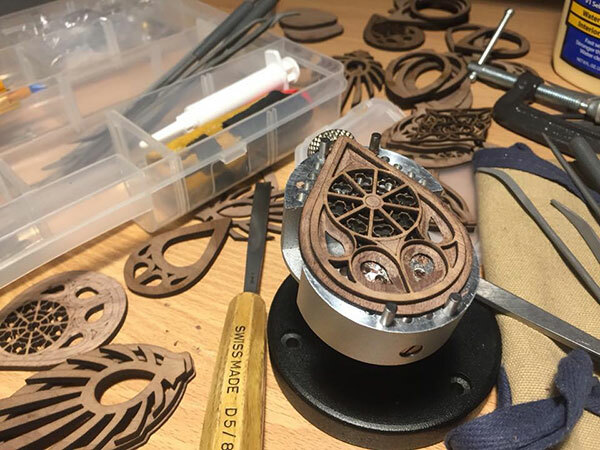 Roughly 3 inches in length and an inch and half wide and carved from walnut, this design is a simplification of the Rose Window design. As a proof of concept….it works. 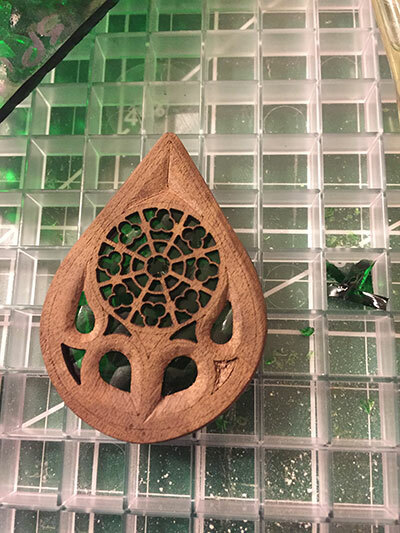 Its made of 3 layers of laser cut thin stock hardwood: a front, a spacer, and a backing layer. The front (seen in the photo above) is hand carved with chisels, files and carving knives and sanded until it has the proper depth and flow. 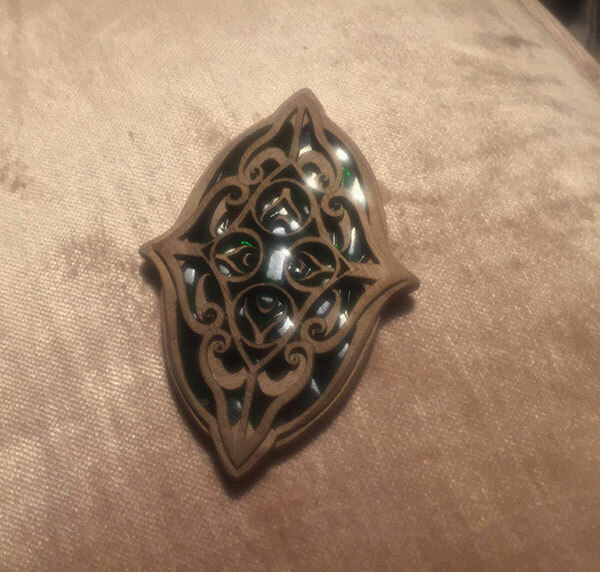 The spacer holds a custom ground medallion of stained glass. 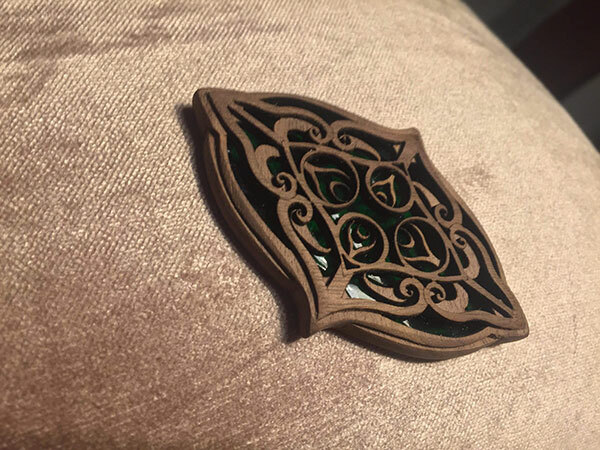 The backing holds the glass medallion in place. So far, so good! More pictures to come. I’m just thrilled that this idea I’ve been working on for so long actually works. You never actually know until you can touch it with your own hands!